What Are Benefits of Onion and Garlic? Whitney Hopler has authored numerous articles and several books in more than 20 years as a professional writer. As an editor, she’s served at The Salvation Army’s national magazines, Crosswalk.com and several newspapers. Onions and garlic are both part of the allium family of vegetables that contain substances to possibly benefit your health in many ways, reports the American Institute for Cancer Research. While onions and garlic cloves do give off strong odors, the sulfur compounds responsible for those aromas are the same substances that provide health benefits if you eat onions and garlic, the Linus Pauling Institute says. 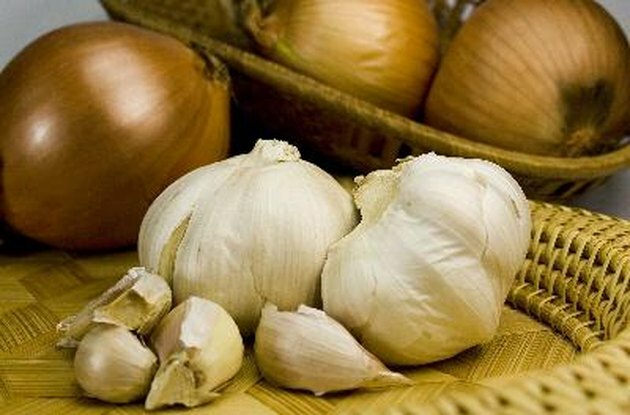 Both onions and garlic might help you combat infections. Onions might reduce the symptoms of bronchitis and the common cold, and they also can fight harmful bacteria, notes the November 2002 issue of "Phytotherapy Research." Garlic has both antibacterial and antifungal properties, according to the Linus Pauling Institute, and it also might strengthen your immune system overall, making you less vulnerable to contracting infections. Onions and garlic might also help you resist cancer. The American Institute of Cancer Research says the chemical compounds inside allium vegetables such as onions and garlic can slow or stop cancer cells from proliferating in various places in the body, such as the lungs, colon, esophagus and breasts. The compounds that onions and garlic contain can also reduce the rate at which cancer tumors grow, or even stop tumor growth altogether, reports the American Institute of Cancer Research. The Linus Pauling Institute says garlic, in particular, might be especially effective as a weapon against gastric and colorectal cancer. Are Purple Onions Good for You? How Do I Roast Pre-Peeled Garlic Cloves?